This conference brings together top accounting students from across Canada, instilling the importance of the accounting profession. This is achieved through a challenging accounting case competition, skill-building workshops, carefully chosen key note speakers, and engaging networking atmospheres between students and industry professionals. 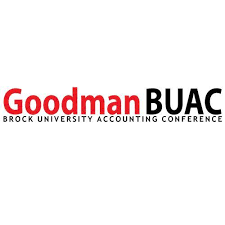 As the climate of the business industry is always changing, the 2018 Brock University Accounting Conference will be focused on the theme of Navigating the Unknown. The Conference serves as a platform to raise awareness of the accounting profession, while empowering and developing the skills of future business leaders. VISIT: www.goodmanBUAC.com for more details!